You don’t need an espresso machine to get it right. There are only two things to remember when frothing the milk: the right temperature and the best milk choice. While having an electric milk frother is not a must, it makes a process a lot easier. It’s effortless – you just splash some milk into the frother, close the lid and push the ON button. It heats and froths the milk at the same time and froths dairy-free options nicely as well. Most frothers also come with a cold froth option. You can find a nice electric frother on Amazon for around $40.00. If you don’t mind spending more than $100 on a frother, the Breville is the best one you can get. It makes perfect froth, hot chocolate and also lets you control the temperature. If you don’t have any extra room in your kitchen for another appliance, you can get a small handheld frother. Aerolatte ($17.00) makes great foam and it’s easy to clean and store. Simply warm your milk, immerse the frothing wand in the milk and whisk until frothy. For the best froth, heat your milk between 140 and 155 degrees Fahrenheit before frothing. The Breville milk frother is by far the best milk frother on the market at this moment. It’s packed with options and really makes an amazing froth. It would make a great gift! Pour the milk in a mason jar (no more than half full to allow it room to froth), screw the lid on very tightly, and shake as hard as you for about 30 seconds or until the milk has become frothy and doubled in size. Remove the lid and microwave the milk for 30 seconds. Slowly pour the milk into your coffee. Pour cold milk in a small saucepan over medium-high heat. Heat the milk to 140 degrees Fahrenheit (60 Celsius), whisking occasionally using a small whisk or a fork. When it reaches the right temperature, remove from heat and whisk the milk vigorously until frothy. Slowly add frothed milk to your coffee. Use any of your favorite milk options: skim, 2%, whole, nut milk, coconut or rice milk. 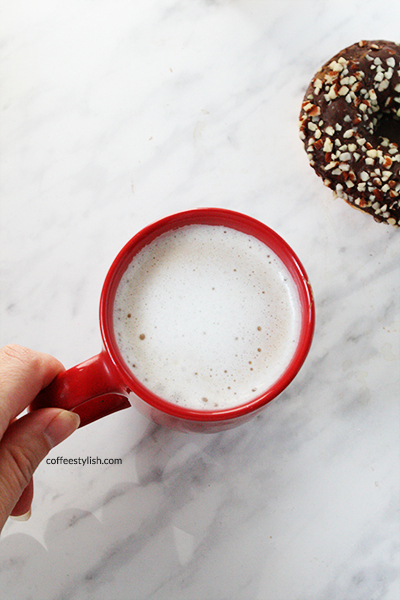 Skim milk froths better than whole milk, but won’t taste as good. Choose skim milk if you like rich, dry foam and choose 2% or whole milk if you want nice froth but also a rich taste. For best results, use 2% and whole milk. How to froth coconut milk? How to froth almond milk? Dairy-free milk options are harder to froth than cow’s milk, so you probably won’t be able to make a super-rich foam without a frother. Luckily, the Aerolatte does a nice job, so you don’t have to spend a lot of money. To make your favorite coffee drinks dairy-free, substitute cow’s milk with almond, coconut or rice milk in 1:1 ratio. Heat the milk on low, and immerse the frothing wand or beat it with a whisk until frothy. For the best froth, heat your milk between 140 and 155 degrees Fahrenheit before frothing.